Lock in a great price for Regency Country Club, Apartments Suites – rated 8.7 by recent guests! Territory and swimming pool was great. 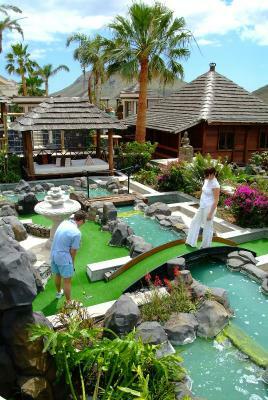 Mini golf is free of charge. Staying at the hotel without a car makes no sense. 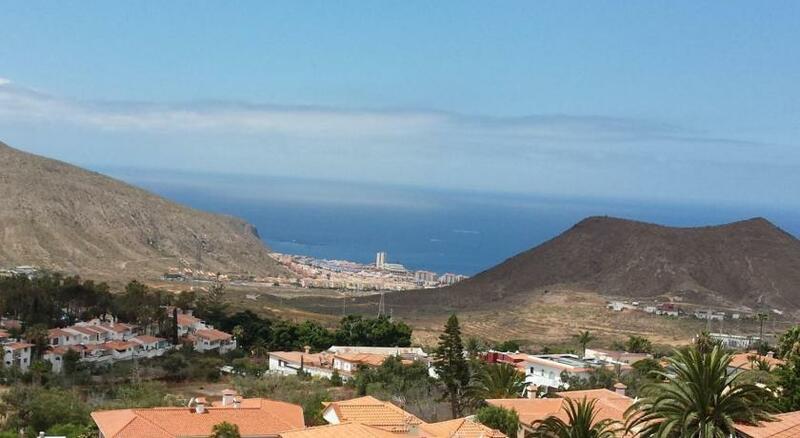 It takes 7 minutes by car to get to Los Cristianos/Las Americas. Breakfast was good but same each morning. 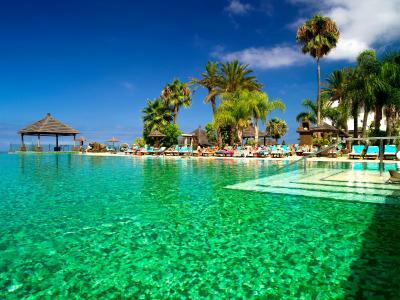 Large swimming pool, jacuzzi, minigolf, friendly staff, quiet and relaxing place. Amazing value but compare prices and deals through their website as well! I scored a great genius discount through booking but my friends got an amazing deal and promo through their website for their room size! The property is stunning, the staff are so amazing and helpful, they sold us water park tickets to avoid queuing, called taxis for us, and even made last minute dinner reservations to an amazing Spanish restaurant (La Finca Chayofa), which was delicious and affordable! They went above and beyond for my daughters bday and left her balloons and a birthday doll as a gift, she loved the gesture! They hooked us up with complimentary wine for our game night, as we traveled with friends! Everything was amazing! They suggested the best beach which was a beautiful sandy beach on the first stop of their free shuttle into the towns. The grounds at this resort were beautiful. From the pool area to the lobby to the restaurant it was beautiful and well kept up. The apartment was outstanding. 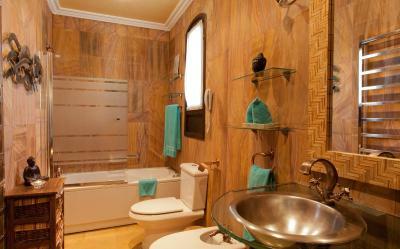 Spacious, luxurious and the facilities like private jacuzzi, sauna and roof top outdoor kitchen were memorable. We really had an excellent time here. Our unit over looks the pool and we had all the bells and whistles. Told reception it was my partners birthday the day we booked in and mine the next day and I really wanted to spoil him a bit. They arranged extra champagne after our dinner and a bottle was in the fridge given to us. The staff remembered our daughters name from the first moment and went out of their way to talk to her and invite her to the activities. 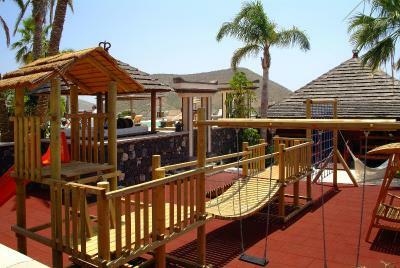 Lovely family resort away from the hustle and bustle of busy towns! Staff were amazing so helpful nothing seemed too much, the breakfast was great well worth the money. 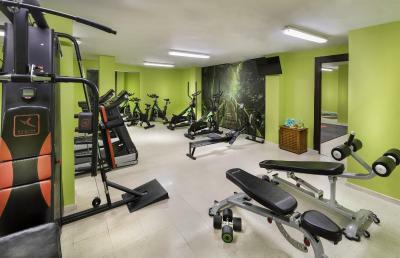 Regency Country Club, Apartments Suites This rating is a reflection of how the property compares to the industry standard when it comes to price, facilities and services available. It's based on a self-evaluation by the property. Use this rating to help choose your stay! 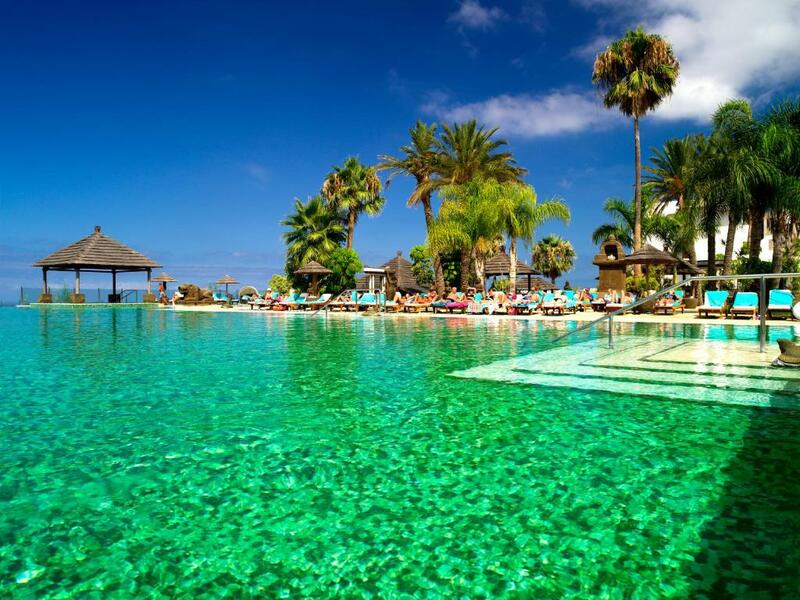 One of our top picks in Playa de las Americas.Regency Country Club offers luxurious accommodations set around an infinity pool, overlooking the Atlantic Ocean and La Gomera Island in Tenerife. 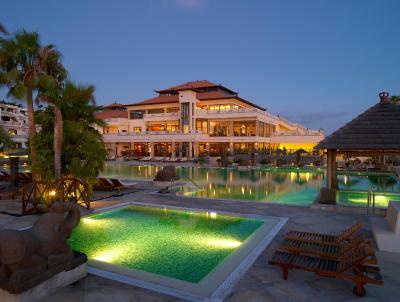 This beautiful resort offers 2 restaurants and a free shuttle service to the beach. Regency Country Club Apartments Suites features Asian-style design with stone and marble finishings. Each spacious,air-conditioned apartment has a well-equipped kitchenette and bathroom. All bedrooms have 4-poster beds. The hotel's restaurant serves breakfast, lunch and dinner. 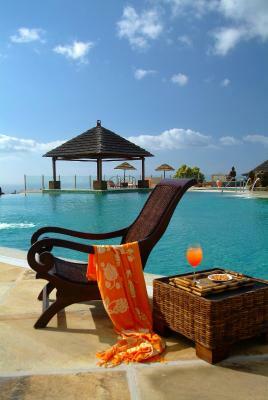 Drinks and snacks are available at the poolside bar. 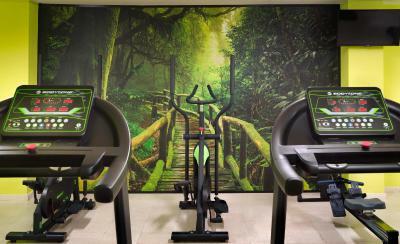 Regency Country Club Tenerife features an on-site gym, and offers massage on request. 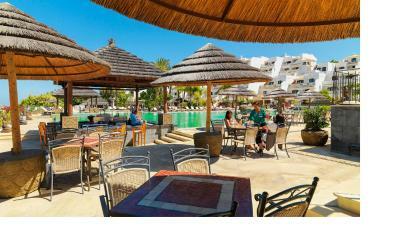 The beaches at Los Cristianos and Playa de las Américas are approximately 2.5 mi from the resort. When would you like to stay at Regency Country Club, Apartments Suites? This spacious, air-conditioned apartment has one twin bedroom and one double bedroom with direct access to the furnished terrace. There is a lounge-dining area, 2 bathrooms and an open-plan kitchen. This spacious, air-conditioned apartment has a double bedroom, a bathroom with a spa tub, a lounge-dining room with sofa bed, and a well-equipped kitchen. 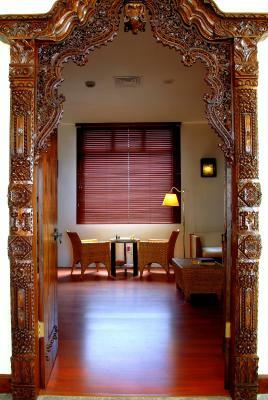 Upstairs, there are 2 twin bedrooms with direct access to the furnished terrace, as well as a rustic-style bathroom. This spacious, air-conditioned apartment has one double bedroom, a lounge with a double sofa bed and an open-plan kitchen. The terrace includes lounge chairs and a table and chairs. This spacious, air-conditioned apartment has one double bedroom, a lounge with a double sofa bed and an open-plan kitchen. There is a full bathroom with a spa bathtub. The terrace includes lounge chairs and a table and chairs. This spacious, air-conditioned apartment has a double bedroom, a twin room, a bathroom with a bathtub, a lounge-dining room and a well-equipped kitchen. The apartment also has a furnished terrace. This suite features a balcony with views of the sea. There is a seating area with a sofa. This apartment features a DVD player, fireplace and stovetop. This apartment has a tile/marble floor, CD player and kitchenware. This apartment features a stovetop, kitchenette and view. This apartment features a dishwasher, dining area and balcony. This apartment features a kitchenette, kitchenware and microwave. This apartment has a flat-screen TV, air conditioning and private entrance. This suite features a view, kitchenette and barbecue. This suite has air conditioning, kitchenware and stovetop. This suite features a DVD player, CD player and dining area. House Rules Regency Country Club, Apartments Suites takes special requests – add in the next step! Regency Country Club, Apartments Suites accepts these cards and reserves the right to temporarily hold an amount prior to arrival. Please note the cardholder name used for the booking should correspond to the guest staying at the property. For reservations made by a third party, you will need to complete an authorization form and present a copy of the person's ID and credit card.